Several HONK fans have been asking me how to get a hold of the HONK “Clay Figures” album. The complete collection is now available as a download. 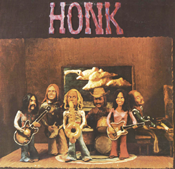 The first HONK LP was released by Twentieth Century Records in 1973. The cover showed clay figures of the band. A second LP was recorded by 20th Century but never released as an LP. In 2004, both albums were remastered and released on a single CD. This package includes all 20 selections as well as the cover art and the booklet. From the first album – I Wanna Do For You, So Much Easier, Don’t Let Your Goodbye Stand, Circles in Sand, Caught on a Greyhound, Another Light, We’re On Wheels, Hidin’ Out, I Wanna Stay, Money Slips Through My Fingers, Buckeyed Jim, Pipeline Sequence. ** These 3 songs also appear on the Epic “Orange Album.” However, those recordings were produced a year later. If you are familiar with the Epic album, you will find it interesting to compare these earlier recordings done by Steve Desper at Cherokee with the later recordings produced by Henry Lewey at A&M Studios.